Outdoor pool Indoor pool open year round Welcome to Pelican Watch - Penthouse condo Wide, white sandy beach Direct beach access View from the beach. Welcome to Endless Horizon - Pelican Watch 1102. This is a condo with an AMAZING view up and down the beach. You will be staying on the top floor (11th floor) in a building with two elevators. When you first walk out onto the balcony you will be blown away at the view of the ocean. You can see all the way north to Wrightsville Beach and south to the Kure Beach pier and beyond. Pelican Watch offers amenities such as a heated indoor pool and Jacuzzi, outdoor pool, grilling and picnic area, and two elevators. It has a private beach access and you will be just steps away to a beautiful white sandy beach with lifeguards during the summer. The lobby is secure and you will have a passcard for entry. This 11th floor condo is completely remodeled with granite countertops, tile back splash, bead board, crown molding, smooth ceilings, tile shower, and gorgeous furnishings. 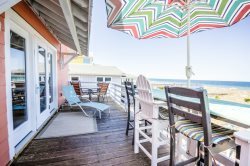 It features 2 bedrooms, 2 full bathrooms, a large kitchen open to the living/dining area and a full length ocean view balcony. The master suite includes a comfortable queen size bed, flat screen tv, and large glass sliders to the oceanfront balcony. The living area includes a queen size sleeper sofa and a large flat screen tv. The second bedroom also has a queen size bed and tv. Whether you want to sip coffee on the large private balcony as the sun rises, relax on the beach before taking a dip in the pool, spend time on the boardwalk, or head into Wilmington to explore historic downtown, this unit will make you fall in love with Carolina Beach! We provide pillows, bed spreads, and blankets. You will need to bring your own sheets and towels or rent them from us. Our island offers two boardwalks, two piers, the NC Aquarium, historic Fort Fisher, a ferry over to Southport, plenty of restaurants, shopping, grocery store - you never have to leave the island! This oceanfront vacation condo on Carolina Beach comes with these amenities. Please let us know if you need additional items and especially let us know how we can make your vacation along Carolina Beach the very best ever! It was well maintained and a great location. Beautiful views. Everything went perfectly from the booking to the updates. I thought it was a great gesture to include local attractions at the beach location as well as nearby cities. I loved the updated amenities. The furniture, rugs, bedding, etc. was recently purchased and made the condo has a fresh, modern feel to it. This is what I look for in pictures before renting a unit. It was nice that the summer rental included linens as well as a new sponge, dish detergent, drying cloth and dishwasher detergent, toilet paper and paper towels. That was definitely an added bonus that was appreciated. The owners also provided two beach chairs that was a wonderful surprise. Always prompt with responses. Easy communication for our vacation arrangements. The location was great. The condo felt like being at home... not a motel feeling at all. It was spacious and clean. The elevators worked quickly... even on a day that someone was moving out of Pelican Watch. And we loved getting a security code and not having to wait to check in. What we did not like about the property was the necessity to have a security pass to get in and out of the ocean side of the building and into the pool. Every question was answered before I asked it... Loved the email updates on what to do in the area, and the clear check-in and check-out process and instructions. The view is spectacular and there was plenty of seating on the balcony! Condo was spacious, updated and beautifully decorated. Greatly appreciated the elevator and both pools! It was a great hassle free experience. The unit was clean and very comfortable. The location is great and the grounds are well maintained. They were pleasant to work with. What is there not to like... The view was gorgeous, the condo is newly updated. Of the smile on my 92 year old grandmothers face when she saw the view from the master bedroom she was staying in!